National Animal Care and Control Appreciation Week! second full week of April every year. The National Animal Care & Control Association is proud to endorse our annual effort to celebrate and promote professionalism within the Animal Care and Control field on the national stage. As with other events designed to promote specific groups, professions, and other important causes, NACA is pleased to provide all the necessary encouragement for all localities who would like to show their appreciation to all their Animal Care and Control personnel. We encourage all Animal Care and Control agencies to have a special week of their own to show off their pride and receive recognition for the important services they provide to their communities. This week of appreciation is designed to give recognition to the hard-working men and women of Animal Care and Control who risk their lives and devote huge amounts of personal time and resources, while they serve the public like other public safety and law enforcement agencies empowered with the same duties. 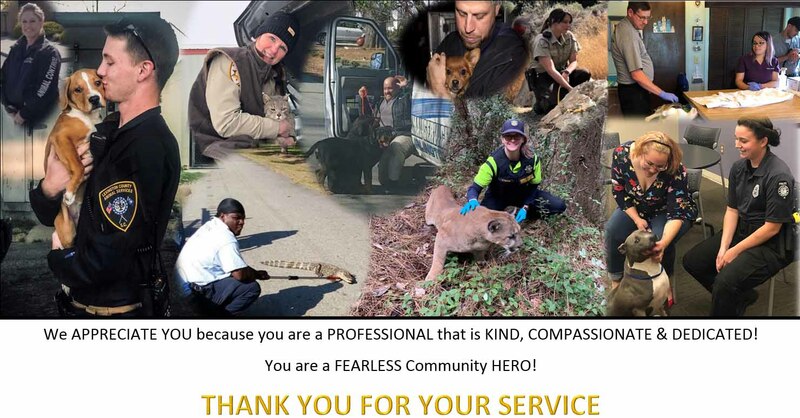 This is the week that these hard working and dedicated Animal Care and Control employees should be honored by having the whole community say, “Thank You”, for helping when no one else could, or would even know how to. The week could kick-off with a public proclamation by a ranking official at a public meeting, or press conference, exclaiming how Animal Care and Control personnel risk life and limb by going out into the public to protect the welfare of helpless animals and pets that are rescued from injury, disease, abuse, and starvation. The proclamation should also recognize that Animal Care and Control personnel provide the essential community functions of enforcing Animal Control laws, protecting the public from diseases such as rabies, and educating the public on the proper care of the community’s pets. Other local departments are encouraged to become involved in this event by sponsoring a meal, or by sending flowers, balloons, or a nice signed card to the Animal Care and Control Department one day during the week to show their support for the work Animal Care and Control does in the community. During the week, an “Employee of the Year” award could be presented in public by a ranking government or community official with plaque or certificate or both for an Animal Care and Control employee that has gone above and beyond in their duties for the community. Animal Care and Control Appreciation Week is a great time of year for Animal Care and Control agencies to connect with the community through local media outlets. Use this time of heightened awareness to inform the community of the services provided by Animal Care and Control, and to educate as many people as possible of the immense effort expended daily by their Animal Control Officers. The final day of the week culminates with a “cake and punch” appreciation party held at a large reception area for all of the Animal Care and Control agency personnel, with special emphasis placed on all the officers and their individual special talents performed throughout the previous year. If you, or anyone in your office has any ideas please send them to us at: naca@nacanet.org.